If you’re afraid that security cameras are watching your every move, things could soon get a lot worse. CCTV cameras will soon be outfitted with facial recognition technology that scans and identifies faces in public 24/7. The technology is being developed as part of a partnership between semiconductor giant Nvidia and security startup AnyVision. Nvidia’s graphics chips will be used to power the human recognition platform being developed by AnyVision. The cameras are equipped with face recognition technology that can automatically identify and track individuals, both indoors and outdoors. Live information is sent to a machine that’s analyzed by algorithms and human monitors, which then compare the face with its database. A ‘state of the art’ system can find links between ‘contacts and their collaborators’ using social networks, AnyVision said. The firm didn’t specify what data from social networks would be collected. 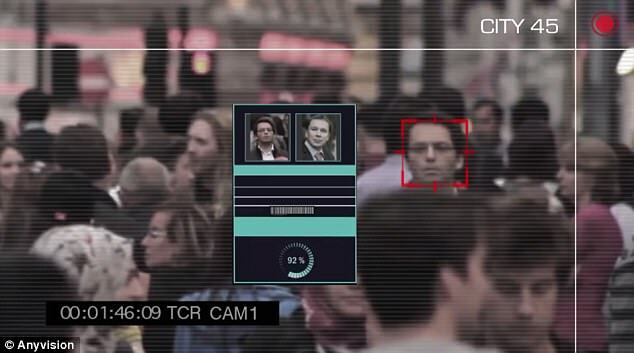 AnyVision claims the technology can detect, track and recognize any person of interest in a large crowd with more than 99% accuracy. ‘By leveraging Nvidia technology, existing CCTV infrastructure in cities worldwide turn into a sophisticated network of smart cameras that allows real-time actionable insights with unmatched accuracy to enhance citizens’ safety,’ AnyVision wrote in a blog post. AnyVision also noted that it works to protect the personal data collected by the CCTV cameras. AnyVision also has an app that can be accessed on smartphones and tablets, providing tactical teams on the ground with a location, photos and a live feed from the cities’ cameras. The technology is also being integrated into CCTV cameras that are located at ATM machines. It’s able to prevent bank fraud and illegal ATM cash withdrawals by comparing the live feed to a photo ID of the account holders face, thereby preventing unauthorized entries. AnyVision notes that it can also be used to ‘secure sensitive places,’ such as prisons and schoolyards, by identifying unauthorized persons, which automatically alerts the system of an intruder. Additionally, AnyVision said casino cameras can be outfitted with face recognition technology to prevent scammers and banned customers from entering the premises, even if they’re wearing camouflage like sunglasses, beards and hats. HOW DO ANYVISION’S ‘SMART’ CCTV CAMERAS WORK? AnyVision is partnering with Nvidia to create smart CCTV cameras across the country. The CCTV cameras are equipped with facial recognition technology that’s capable of scanning and identifying faces in crowds, airports, schoolyards, prisons, ATM machines, casinos and other scenarios. Facial recognition technology automatically identifies potential persons of interest and sends that data to a system being analyzed by algorithms and human monitors. AnyVision says the technology is ‘more than 99% accurate’ in large crowds. 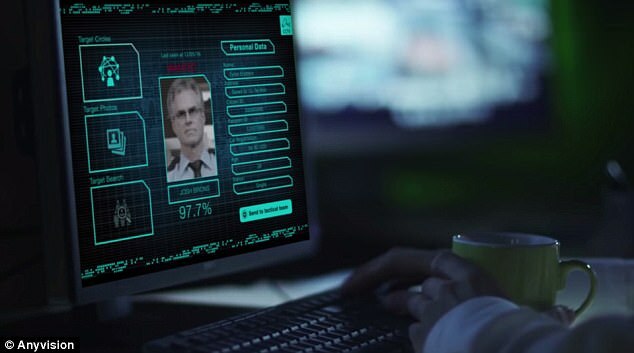 The face is compared with information in a data system, which can determine if the person is a known terrorist, criminal or missing person. 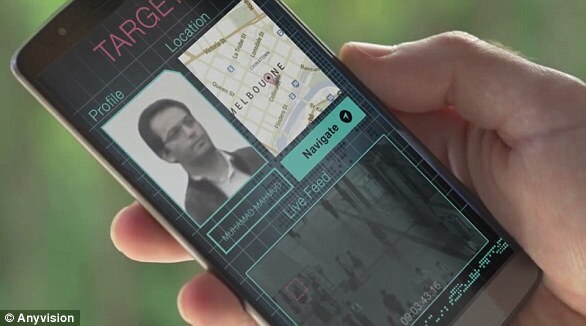 AnyVision built an app for use by tactical teams on the ground. Tactical teams have access to live locations, photos and video feeds to help them catch a suspicious person. The technology is being developed as a part of Nvidia’s Metropolis Software Partner Program. The program aims to ‘put deep learning to work,’ by working with software companies to create ‘smart’ cities. ‘We’re taking advantage of the more than 1 billion video cameras that will be in our cities by the year 2020 to solve a dizzying array of problems,’ Nvidia explains on the company’s website. And, there are other potential uses. Nvidia noted that it’s working to build video-based, automated control of traffic signals to ease traffic. The company also wants to build cameras mounted on traffic lights to help people find parking spaces, in addition to using cameras to improve maintenance of roads and bridges. Photos: Nicole Sherzinger steps out for dinner with mystery man in West Hollywood..